Sundered, the follow-up to hand-drawn indie Jotun, is out on July 28, 2017. To celebrate, developers Thunder Lotus Games are giving away Jotun: Valhalla Edition for free on Steam and GOG. Be quick, though – the offer ends tomorrow, Monday July 17, 2017 at 9:00 PDT / 12:00 EDT / 18:00 CEST / 17:00 BST. For more bright ideas and quirky art styles, check out the best indie games on PC. If you’re keen, pre-orderers snag a 10% discount off the game, and a free copy of its soundtrack. 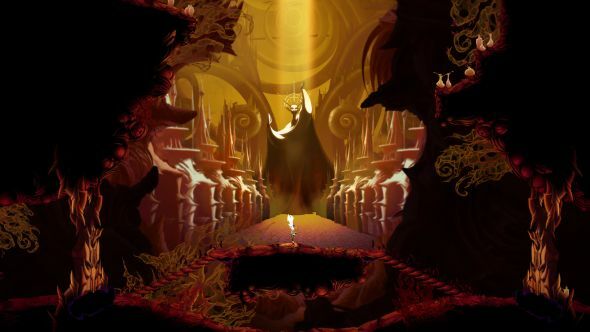 Sundered is described as “a horrifying fight for survival and sanity.” You’ll play as Eshe, exploring a ruined world of ever-changing caverns overrun by eldritch horrors and battling against gigantic bosses, which can only be defeated by spending your very humanity to harness the power of corrupted relics. Like its predecessor, it features colourful, hand-drawn artwork but the developers reckon it has more “complex mechanics, tons of replayability, and meaningful choices” than Jotun. Thunder Lotus Games smashed their Kickstarter target for Sundered in less than 24 hours, topping out at CA$ 202,102, dwarfing their original goal of CA$25,000.